. . . . . I read the article Fracking’ fractures N.Y. county with a degree of disbelief. It was a well balanced handling of a polarizing issue. Yet, I was amazed how individuals can be so divided. How anyone can say fracking, the controversial method used to drill for natural gas, is “absolutely” environmentally safe, as a dairy farmer quoted in the article did? That statement indicates to me that he is misinformed or blinded by the vision of dollars rolling into his bank account (News, Aug. 24).
. . . . . Your story on natural gas fracturing and the fractures among friends is well-known by our family in rural Wisconsin. Years ago, we entered into an agreement with a reputable quarry operation that spent several years preparing for a permit application. Shortly after the permit became public, long-standing friends refused to speak with us, some members left our church and we were publicly accused of being poor Christians.
. . . . . Even our children were shunned by friends whose families were against the quarry. Our promises of never doing anything that would cause another family distress have fallen on the deaf ears of those who think profits drive all decisions.
. . . . . A controversial method of natural gas drilling known as “fracking” has pitted communities in New York against each other, and for good reason. Proponents of fracturing, who in the case highlighted in USA TODAY’s article are dairy farmers, support it because profits from leasing their land and royalties could help them get their farms out of debt. Unfortunately, this is shortsighted and has the possibility of ruining the very farms they are attempting to salvage.
. . . . . “Fracking” involves injecting water, sand and chemicals into the earth with the intention of releasing the natural gas trapped deep inside shale deposits. In areas where fracking has been used, such as Colorado, Wyoming and West Virginia, the chemical stew can wind up bubbling to the surface or leach into drinking water. There also have been reports of it creating flammable water and unusable land. Michael Bowen; Cheektowaga, N.Y.
. . . . . The careful reading of these three letters shows a single flower, Glyn Thorman, between two liberal thorns. 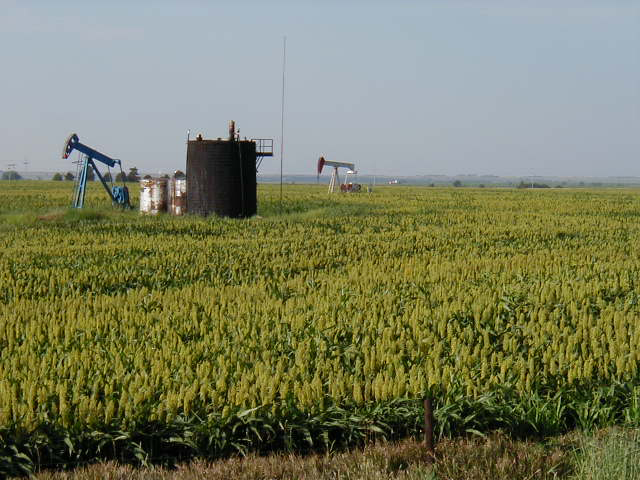 As one who grew up in the oil and gas producing areas of Kansas, the uneven and chance distribution of potential wealth brings man’s character into clear relief. Revenue from oil and gas production may result in large numbers of folks with uncommon wealth directly across the road from other folks who must continue to work for a living.
. . . . . This uneven distribution of wealth highlights the wisdom of it raining upon the just and the unjust alike. Like poetic justice, these evil new rich folks, through progressive income taxes, will pay the cost of government for themselves and hundreds of others, who pay no taxes at all. It is much like “fracking” the rich to extract as much money from them as needed to provide a safety net for the huddled masses.
. . . . . From reading the letters, it is hard to tell if fracking is a dangerous and controversial process because of the wealth it may produce, or because of contaminated groundwater, flammable water (? ), and unusable land as a byproduct. One suggests that if fracking is not absolutely safe, it must be absolutely evil. The other claims that fracking pits entire communities against each other, and for good reason. Of course, nobody is interested in endorsing a “chemical stew”. In the name of these many (undocumented and supernatural) evils, the environmentalists have stopped all drilling in New York.
. . . . . The environmentalists’ Nirvana is to return to the days of the hunter-gatherer. There we will all roam the vast jungles, forests, mountains and plains in sheepskin loin cloths picking fruit and berries off the trees. Knowing that we are only one step away from becoming a part of the food chain, we have not yet developed our evil ways. We are excellent runners, and for those of us who are not eaten during childhood, an old man and occasional woman might become 25 years of age. Hello!! Nirvana.
. . . . . To environmentalists, fracking (fracturing) is a frightening new term. It has been used successfully on millions of wells since the 1940s across the face of America. It has been used on some portion of 1800 new wells in Pennsylvania alone during the past year according to the USA Today article. Environmentalists’ problem is with oil, not with fracking. They object to oil, natural gas, coal, and most anything else that is extracted from the earth. If it were not for the essential contribution of water to life, they would probably object to drilling for water.
. . . . . Fracturing is often performed during the initial drilling phase with marginally producing wells. When successful the well may produce oil or gas in quantities that will cover the cost of production and generate revenue for many years. A nicely “fracked” well, one time, may become a producing well for many years or decades.
. . . . . Environmentalists classically exaggerate any and all consequences, regardless of how remote, into inevitable catastrophes, if not immediately, then within the next 500 years. In this process they delay and destroy the development of natural resources required of a thriving environment and a healthy population.
. . . . . The following picture is poetic and shows one view of scenes which are commonplace across south, central, and western Kansas where oil and gas wells are abundant, and fracking has been used routinely for 60 years. It is clear that these two producing wells coexist very nicely with an abundantly healthy feed crop. Such wells coexist equally well with food crops, cattle and dairy farms. Any notion that fracking is the devil incarnate seems to have migrated from Kansas, where it never materialized, to New York state, where it has been reincarnated by environmentalists.
. . . . . These land-based oil and gas wells above are capable of operating 24/7, and are not known to be a significant hazard to any living creatures. 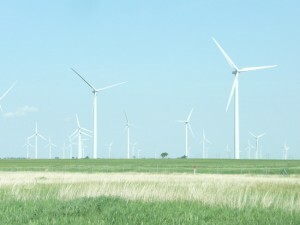 A few miles from the above scene, is a “renewable” power system in north central Kansas as shown below. 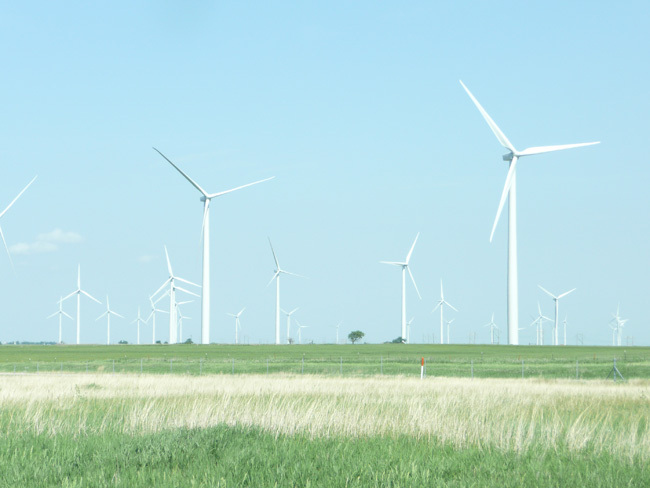 It displays Kansas’ attempts to produce the power for those environmentalists who refuse to produce it for themselves. While the pumps above scarcely mar the scenery, these dozens of behemoths below are an invasion of the heavens, and are a menace to migrating birds on their journeys both north and south. Where are the environmentalists when you need them most?
. . . . . Let’s all just turn the clock back ten thousand years, revert to our loin cloths, pick our fill of fruit and berries, and prepare to run for our lives. The slower runners, like women and children, will be eaten first! What a great way to control our out of control growth in population!!
. . . . . Many environmentalists are clones of the Tin Man in the Wizard of Oz: If they only had a brain!! And many think it is the Republicans who want to turn the clock back to the good old days!!! ps: When oil is pumped from a well it is always some combination of oil and water. These must be separated. Reports that fracking creates “flammable water” ignores this basic information. The last known reference to such supernatural water was called “fire water”, and was usually found on, or near Indian reservations. I think what the Indians discovered was not really “water”.